Mike Bryant is one of the unsung heroes of the culinary scene. He is a joy to watch in the kitchen – no wasted movements – just a studied “ballet” of intense concentration and fastidious execution. The photos that follow are from many meals with Mike. They are just a peek at this creative chef’s talent and ability. Watch for this up and coming culinary star. Michael took a block of 500 million year old sea salt and heated it for 45 minutes in a 700 degree oven. 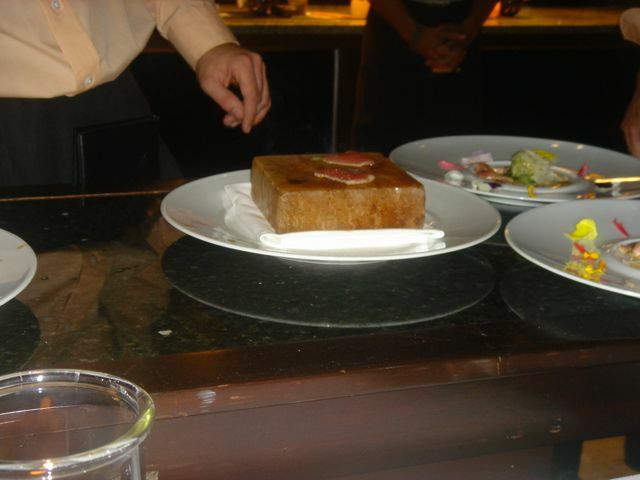 He then took tuna sashimi slices and seared it on the salt block, tableside. 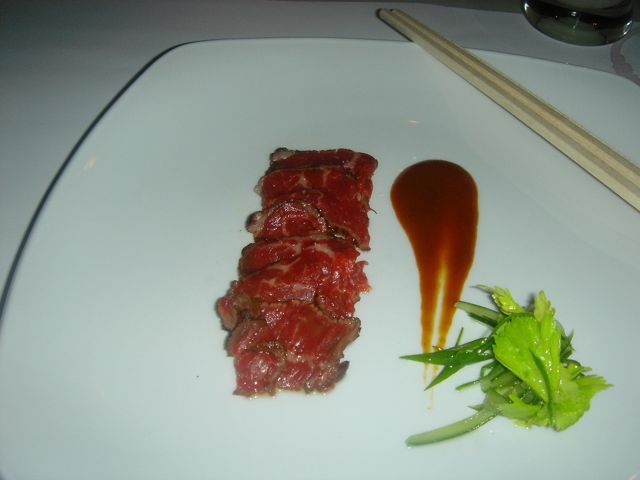 This was definitely reminiscent of toro being seared on a hot stone at Urasawa. 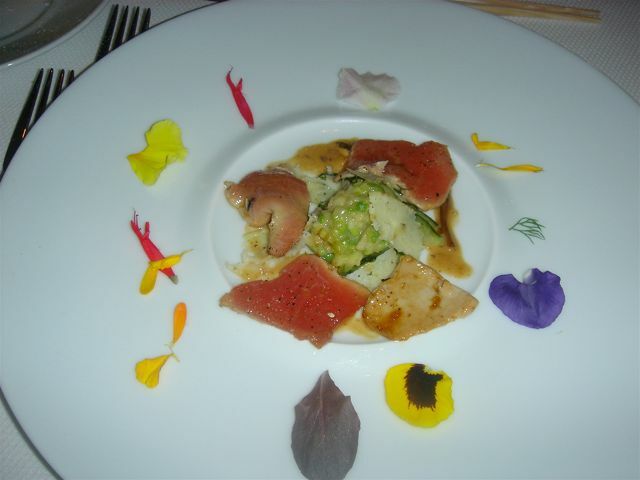 In the center of the plate was a mixture of cucumber, chayote, asparagus, shaved somen noodles with miso vinaigrette. Ringing the plate was a light saucing of fermented black bean and mushroom jus plus edible flowers. Absolutely delicious. 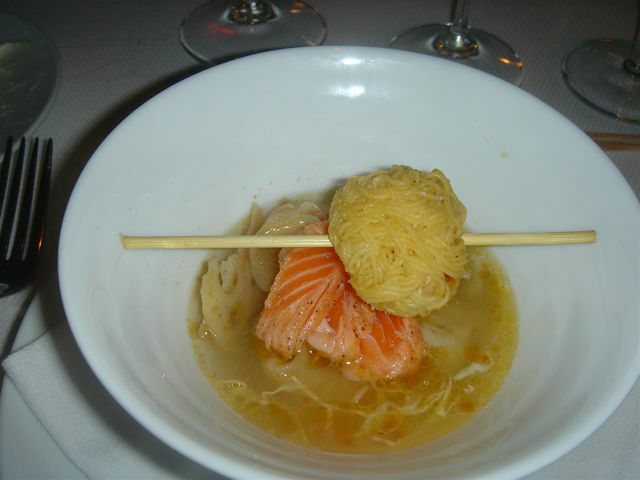 Salmon sashimi slices, lobster won ton in a dashi broth.. At the bottom of the bowl was a coddled egg, soy braised lotus root and kimchi. On top was a skewer of lobster mousse that had been wrapped first in pancetta and then some type of pasta, deep fried. 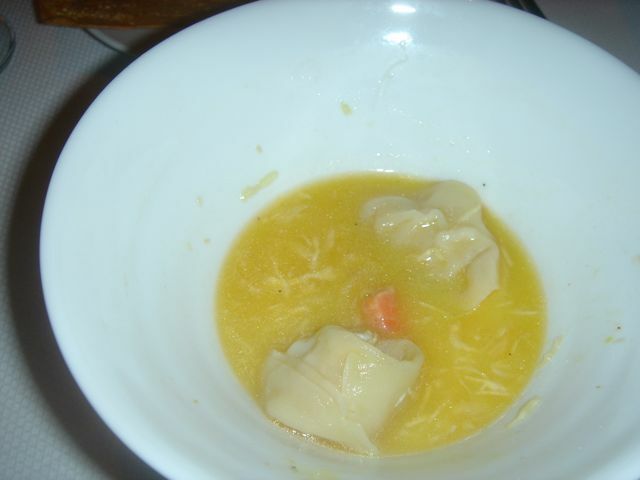 The second photo shows the broth mixed with the egg that made for a creamy, thick and luscious broth. The lobster wonton was delicious. Scallop Tiradito with Saifun Noodles and Ponzu. 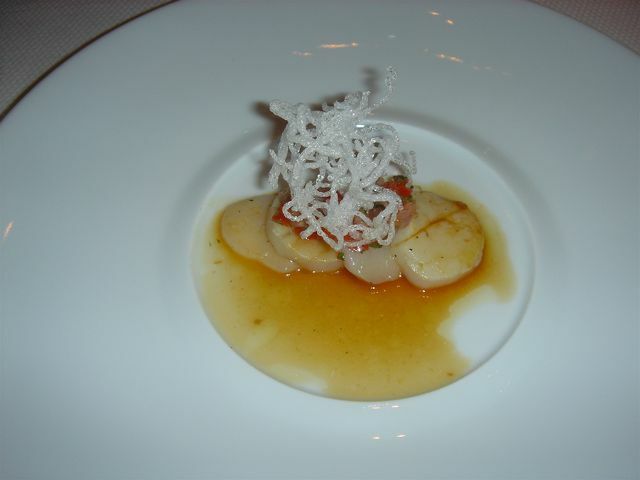 The scallops were treated like a ceviche – sliced thin and “marinated” in a citrus-based “sauce.” On top of the scallops were tiny, diced bell peppers and cucumber. The deep-fried Saifun added a crunchy, textural component. Excellent. 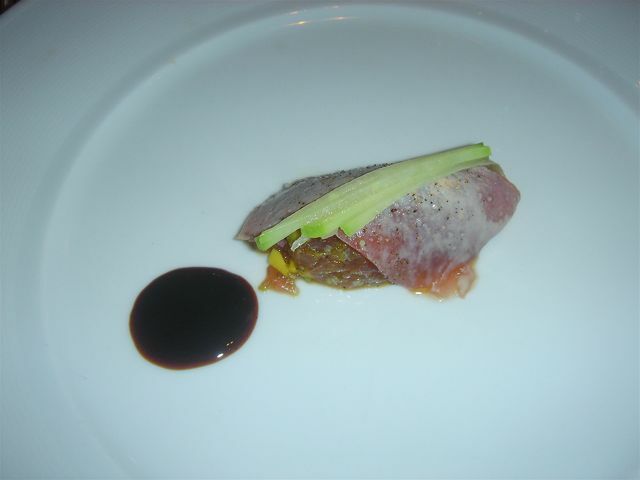 Tuna Tartare draped by a slice of tuna. 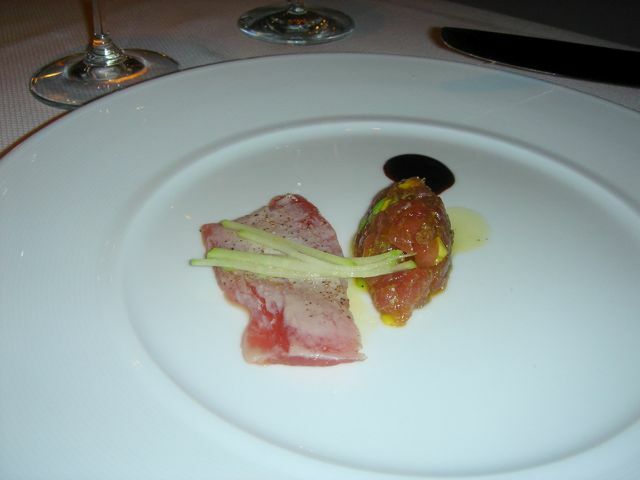 The tuna was done tataki-style with chayote squash. To the side was a rum and pepper “paint.” Again, excellent ingredients done beautifully. The paint added a touch of heat in a good way. Braised Veal with Parsnip Foam, Parsnip Puree, Chorizo Froth and a Summer Truffle. This was a last minute creation of Chef Mike and an A+ dish. I can’t begin to describe how well these flavors blended and it reminded me of Ludo’s cooking at his best. To the left was Monkfish studded with bacon, preserved lemon and parsley and wrapped in caul fat with their version of A-1 sauce. 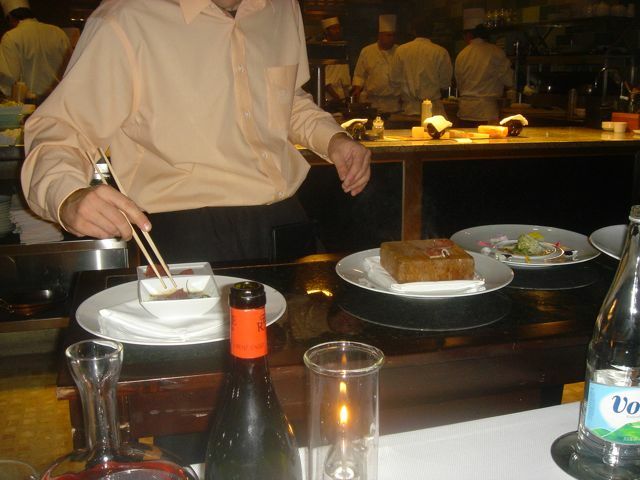 The A-1 sauce was not the deconstructed version like Grant’s at Alinea, but a deeply concentrated, integrated rendition of what A-1 sauce can be in the hands of a talented chef. 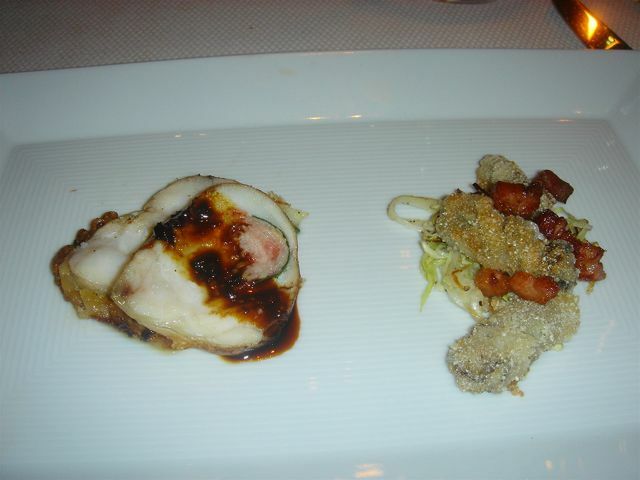 To the right were deep-fried Malpeque Oysters, applewood Bacon, Braised cabbage. My notes are very exact as Chef Mike was presenting the dishes and as long as I could write fast and keep my wits about me, I think they are accurate. This was just superb. 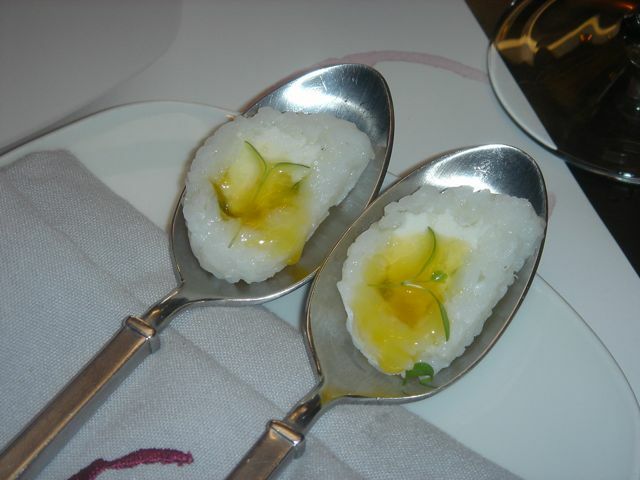 “egg yolk sushi” – Actually the “egg yolk” was actually orange gastric atop cream cheese and encircled with rice. Delicious. Oyster Rockefeller – Prince Edward Oysters with Herb crema, Gruyere, Uni foam and American Caviar – this is a marvelous dish. I just slurp up the oyster so I don’t lose one drop of anything. Maine Diver Sea Scallop with Potato casing, crème fraiche, soft poached egg and American caviar – I love this dish. There is a base of crème fraiche, then the scallop (none for John as he hates scallops – first photo), then a potato tube on which sat the poached egg and topped with caviar. The potato tube is extremely labor intensive. It is made with a Japanese spiral slicer that produces long thin threads, almost like a thin noodle. It is then wound around a tube and deep-fired. Gorgeous runny egg with the scallops – my dish. Blue Corn tacos filled with red snapper ceviche, house-made guacamole, cumin crema. The tacos sat on a bed of pickled cabbage and a touch of lobster oil sat on the plate. 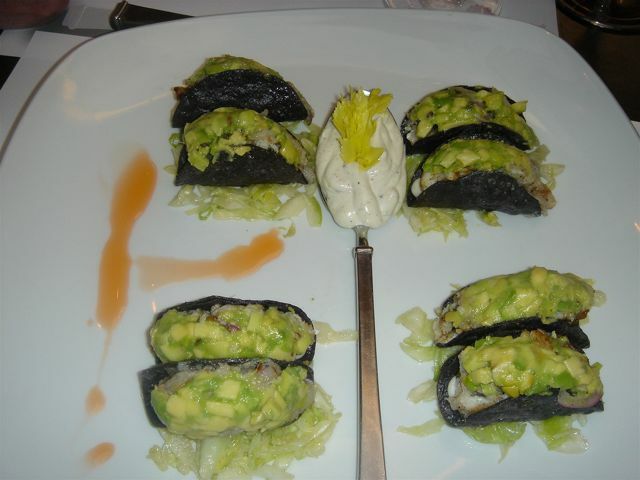 The crunch of the taco with the ceviche, the smooth creamy avocado and the cumin crèma adds up to one great dish. Pacific Striped Sea Bass stuffed with a mixture of chervil tapenade with gnocchi and creamed corn as the base. The creamed corn functioned as a saucing for the fish. Molasses Glazed Monkfish, celeriac puree, pickled fennel, arugula oil – it is Mike’s ability of combining textures and flavors that is the hallmark of his cuisine. 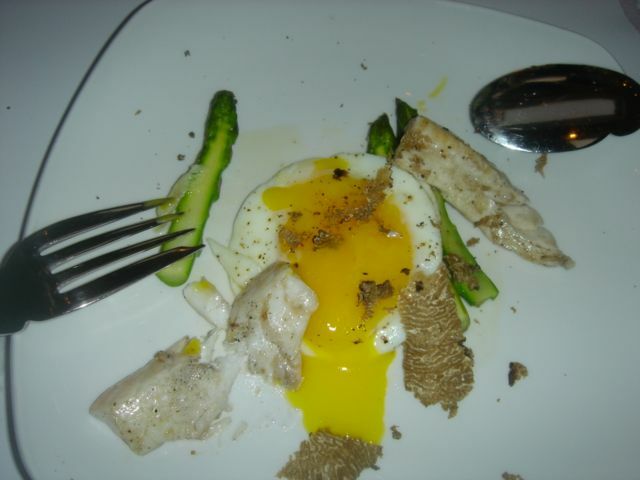 Pacific Striped Sea Bass with asparagus, fried egg and summer black truffles from Italy – another winner. Crispy Frogs Legs with Vandouvan Butter Sauce and Orange Segments. Vandouvan consists of a blend of curry leaves, fenugreek, mustard seeds, and garlic. This was just delicious. I could have eaten a dozen. 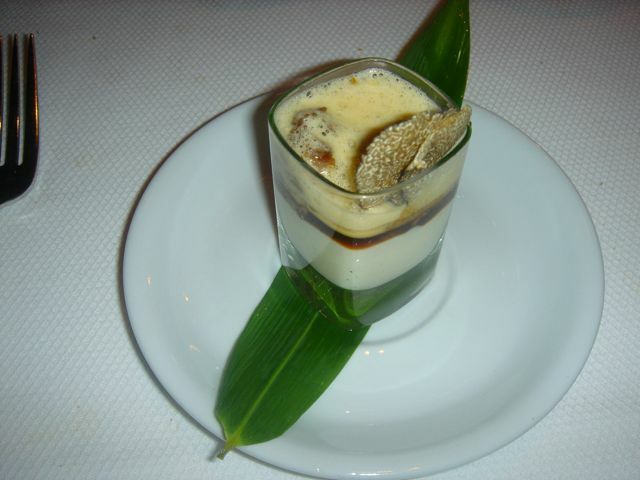 On a caramelized plaintain was seared foie gras and house-made duck proscuitto – the plaintain added a wonderful foil for the foie. 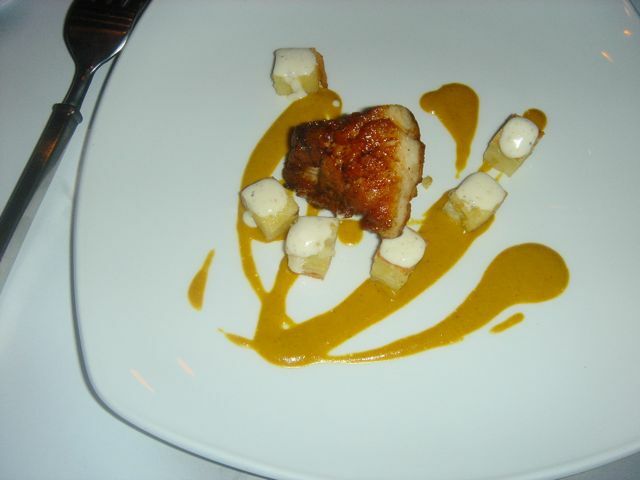 Veal Sweetbreads with cubes of somen noodle cake topped with a dollop of cumin/lime crema and yellow curry sauce. The curry sauce was just perfect as was the noodle cake and the sweetbreads. Pork Roulade. The pork had been stuffed with a mixture of chopped scallops and shrimp. It was served with herb spatzle and Bing Cherry demi Glace – I had some doubts about this dish as it was described, but boy was I wrong. What a splendid combination. The texture contrast between the pork and the chewiness of the scallop was perfect. And finally at Joe’s as chef de cuisine. 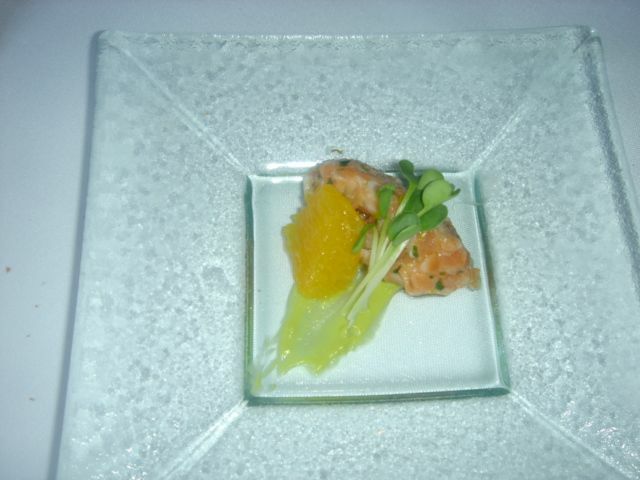 Sea Urchin Mousseline topped with Salmon Roe with Corn, Tomato, Scallions. Curried Yogurt, Creole Mustard Vinaigrette – lovely dish – as pretty to look at as it was to eat – of course the mousseline was perfect. Seared Maine Diver Scallops, Razor Clam “Casino”, Sheep’s Milk Ricotta Flan, Snap Peas, Roasted Corn Foam and Curry Butter – the razor clam casino is another wonderful idea and the flan was delicious. I look forward to many more meals from this talented chef.